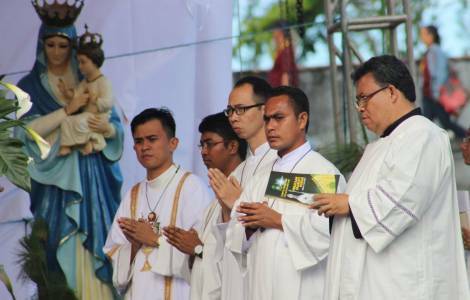 Manado (Agenzia Fides) - Seminarians and priests in Manado, capital of the Indonesian province of North Sulawesi, in eastern Indonesia, are not lacking. As a matter of fact, they are overabundant. As Fides learns, in the retreat for the local clergy organized from 4 to 8 September, the diocese had to create three different groups, each with 60 priests. "We had to look for a larger gathering structure and subdivide participants into subgroups", says to Fides Fr. Albertus Sujoko, of the Sacred Heart Missionaries (MSC), at the head of the Sacred Heart Major Seminary, recalling that "in the last twenty years there has been an exponential growth of the number of priests". The new Bishop of Manado, Mgr. Benedictus Estephanus Rolly Untu, MSC, now has an adequate number of Pastors to serve the people of God in the diocese and "is trying to increase the collegiality in the relationship with the priests", states Fr. Sujoko. In 2015, two diocesan priests and five MSC priests were ordained; in 2016 three diocesan priests and four MSC priests; five diocesan priests and two MSC priests in 2017. In recent years, even the development of the number of diocesan seminarians has been remarkable: "In the academic year 2016-2017 we had 81 major seminarians. This academic year 2017-2018, the number is over 100 and next year, with the new arrivals from the College of Tateli, they will be over 190. That is why we are widening the structure of the Major Seminary of Pineleng ", continues Fr. Sujoko. According to the data provided to Fides by the diocese of Manado, there are 106,654 Catholics in the diocese which includes three provinces (North Sulawesi, Central Sulawesi, Gorontalo), which altogether have a population of 6.5 million people. The parishes are 61, served by 96 diocesan priests, 41 priests of the Missionaries of the Sacred Heart, and 3 other religious orders.